This post was sponsored by BKY Kids. I love useful gifts. Some of my favorite gifts that we've made together have been cute and have served a purpose too. 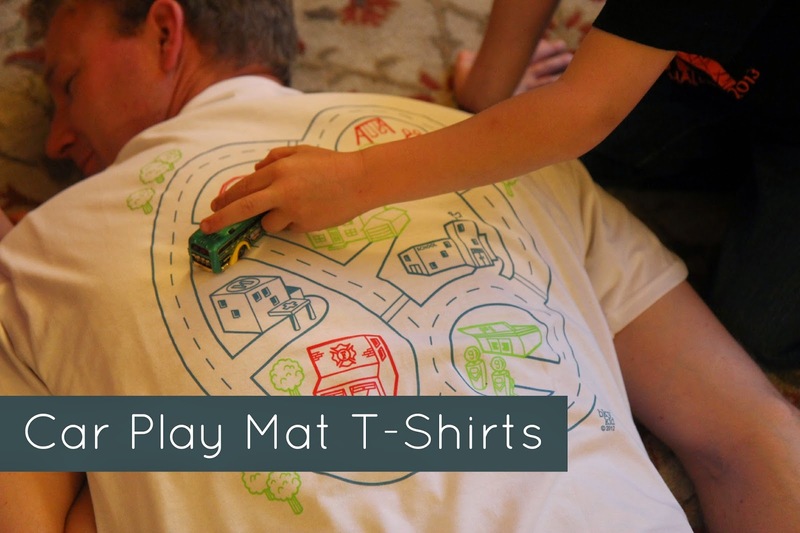 Today I am excited to share these adorable Car Play Mat T-shirts from BKY Kids with you! They would make awesome Father's Day gifts or birthday gifts! Make sure you scroll all the way down so you don't miss our Car Play Mat T-shirt giveaway! 1. It is an activity and gift all rolled into one. I'll explain more further down. 2. It gives dad a break... AND a massage. 3. I didn't have to make it. I tried making my own version of this t-shirt before... it was not cute. When my husband slipped the shirt on, (he got size Large) he was surprised at how well it fit AND how comfortable it was. Once he lied down I was worried we wouldn't hear from him again... he looked way too comfortable once the kids started driving their cars on his back. My kids love pretend play and our t-shirt came with a story book! It had a super simple story inside and my kids loved acting it out! As I read the story... and my husband relaxed on the floor, the kids drove their cars around on his back based on what I was reading. The story got them listening, following instructions, and problem solving. The kids liked driving on the play mat when it was sideways too as my husband sat up... they thought the "hills" were fun! Once we read the story that came with the t-shirt, the kids decided they wanted to make up their own stories! They grabbed a few more car props (a stoplight, road signs, and a few other cars) and took turns telling me a story while I drove cars around on my husband's back (and I had to follow their directions). It was adorable to listen to and such a great learning activity. They worked on basic story sequencing and giving directions while we played. The only downside to this activity was that sometimes the kids were having so much fun on the playmat that they forgot their dad was wearing it! Good thing my husband was easy going and didn't mind a knee on his shoulder from time to time. He loved having a reason to relax on the floor and get a massage! In addition to making Car Play Mat T-shirts for men, BKY Kids also makes t-shirts for women and children! We had fun trying out the Kids Car Pocket T-shirt with my car-obsessed toddler and my preschooler. The Kids Car Pocket T-shirt is darling! There is an adorable little pocket on the front of the shirt for a car to hang out in (see below). My toddler who loves sticking things inside pockets and bags and boxes thought it was fun to put the car in the pocket... pull it out... and put it in again. Since the t-shirts run a little big, I loved that my 18 month old could wear the size 2T t-shirt (he is on the bigger side) AND my 3-year-old daughter could also wear it. They had fun taking turns putting the shirt on and driving cars on each other's tummies and on themselves! 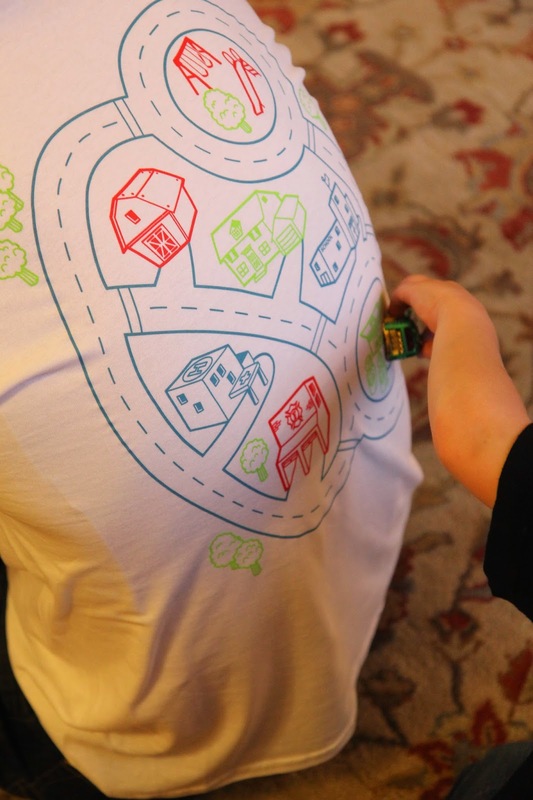 The Kids Car Pocket T-shirt has a simpler design than the adult shirt with less locations on it. I liked that my toddler knew what each picture showed, so if I mentioned driving his car to the pizza or football, he knew where to go. I got in on the fun too and drove cars on the kids tummies! My kids thought it was so funny to drive the cars on each other and after they did some driving they inevitably ended up in a big pile of tickles, hugs, and giggles. BKY Kids also has number tracing and railroad t-shirts too. 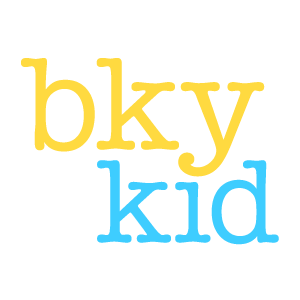 Pop on over to the BKY Kids etsy shop and check them out! BKY Kid is also offering a COUPON CODE for our Toddler Approved readers if you order 2 or more shirts!! So if you get an adults and a kid's shirt, or men's and women's, or shirts in 2 different designs, you get FREE shipping. Today I am excited to give away a BKY Kids t-shirt to ONE of our awesome Toddler Approved readers! The winner can choose one t-shirt from BKY Kids (other than the organic ones) as their prize! Click here to check out the options that are available. You can get up to seven entries by completing all tasks mentioned in the rafflecopter form below. Some earn you more entries than others. The winning entry will be drawn on Thursday, May 22nd. I will notify the winner via email. Disclosure: This post was sponsored by BKY Kids. All opinions are mine! I also tried a homemade version of this that turned out quite poorly. Thanks for sharing this. A fun Father's Day gift for my car lovers. This is so adorable! Thanks for the great father's day idea! Oooo! So cute! My hubs wears a XXL Tall though. I love the toddler pocket car shirts! I love the car and railroad shirts. My hubby would love them too! Such a cute Father's Day idea! Railroad Play Mat T-Shirt for Dad, Size 2XL. Car Play Mat T-shirts for men!! They are all cute but I like the car ones the best. Although the number one would be fun to trace with fingers. A back rub while your child learns to write his numbers, can't beat that! Would love the men's large car mat t-shirt! Love the car mat shirt! I love the mens car tshirt. This is such a cute idea! I'd pick the railroad mat my little guy loves trains! We're always building tracks around here! So cute! Thanks for the opportunity! I was going to try to make my own for Father's Day this year, but I would love to win the men's car t-shirt!!! I would get the Kids Car Pocket too if I won. The space ones look really cool but I think I'd just get one for my son to wear he loves pockets too! Aw! Love the toddler pocket shirt, but I know Daddy would love getting a break with this fun idea! Would love to win the mens car shirt. Would love to win the mens car shirt. This is awesome. It would be a perfect Father's Day gift from my almost 3 year old. He loves cars!!! I would get the train or car tshirt. I think my husband would love one for Father's Day! I would get the car or train shirt. My son is all boy and would get a kick out of the shirts! The men's shirt for dad! I would love to get the Car Play Mat T-Shirt [L] for my husband, he and the kids would love it! Remember this from my childhood! I would LOVE this adult shirt for my husband. He would gladly nap while the kids massage his back. With 2 LO's and one on the way, I could see it being used for years. Not only would it calm him when he was stressed, but give them something to do! I'd love the car play mat t-shirt for my husband! Love this for fathers day! On his back, he/they would love this! LOVE!! My kids would love these! Oh…forgot to say which one…A kids one AND one for dad!